A Boat Race (Beer on a Table Race), is a drinking game played between two teams of equal numbers. It's a game of speed and cleanliness; each team will line up, drinking a beer participant by participant until completed. Majors and minors are assigned for spillage, there are variations to the rules as well. Boat races have nothing to do with the nautical arts. Sub Two: This means your chug time is below two seconds. Think hard about what you've done to achieve this. Anchor: In a two beer boat race, the order is from left to right to left (12344321). The person who drinks two beers in a row, in this case person #4, is the anchor. Ace: Ace is the person who begins and ends the boat race on each team. This position is coveted for it's ability to change the outcome of the race; a lazy ace could ruin it, just as well as a speedy one could win it. Regulation Cup: This is the variation of plastic cups provided to the EUS by Sleeman; it holds 16oz, but the more important factor is the flexibility of the plastic. It is approximately equal to this model, and is a staple for any boat race. Tapper:: The person whom is charged with telling each team member when it is their turn to drink by removing their hand from the members back; this is more common in Competitive Racing. Major: This is when an obscene amount of beer is spilled, which in the context of a boat race is approximately 3oz+. Every major will result in the addition of 5 seconds to the team's time. Minor: This is when any amount of beer is spilled less than a major. Every minor will result in the addition of 2 seconds to the team's time. Differentiating between a Major and Minor is at the discretion of the referee/coord in charge. Boat races are likely the most popular competition hosted at McGill, athletic, academic or beverage based. Competitive boat races consist of 10 racers on each team, with a minimum of 4 girls, each drinking 2 beers one at a time, as fast as possible, in a ladder format. What that means is that teammates lineup on one side of the table and drink a beer each going in one direction, before drinking a beer each coming back in the opposite direction, such that 1 person drinks 2 beers in a row in the middle of the race and one person drinks both the first and the last beer. The conventional wisdom is this: You only compete with 4 girls. This is almost always an effective strategy in that you 5th girl will be slower than your 6th guy unless you are a nursing team or somehow have a disproportionate amount of girls. Typically teams will put a guy in the ace position, followed by 4 girls in the 2,3,4 and 5 spots respectively, before putting the remaining 5 guys in the 6,7,8,9 and 10 anchor spots. 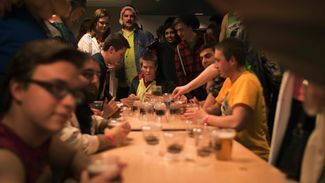 The order is typically chosen with those having the fastest 1 beer time going in a higher position (i.e your fastest person goes at 10 and drinks two beers consecutively midway through the race). Participants are typically chosen by finding people with the fastest one-beer chug times, which is often erroneous. In trying to find those people with the fastest one-beer times possible, teams are often designed to have the fast “best case scenario” time possible rather than a team built to avoid going slowly. Those who slow down on their second beer, with the two groups being linked intricately. The main problem that comes from picking people based on their best one-beer time is that you are picking based on what could be an anomaly, and that you are refusing to award consistency. The second issue that arises is that the competition involves drinking two beers and very rarely is any method used to evaluate someones ability to drink the second beer, or more aptly, to avoid slowing down too much. Teams will add up each person’s fastest one beer chug, multiply it by 2 and say that they could complete the race in 60 or 70 seconds without acknowledging that people will likely not achieve their best time. What teams should be trying to do is minimize their deviation from a good score, to try to be great at being good rather than just trying to be amazing. Those who, if given a few second to recover, can drink another beer with little to no drop-off. Take two chuggers who we will assume to have a representative sample of 40 chugs on (this may seem unrealistic; however, if you think so, it’s probably not for you). They minor 7.5% of the time and doesn’t major. To compare these two chuggers average time over two beers, one simply multiplies the one beer time (1BT) by 2, adds the drop-off time, multiplies the minor and major percentages by 2 (accounting for the two beers) and multiplies them by 2 and 5 seconds respectively. Now clearly here the numbers are chosen for effect, but the point is that these two hypothetical chuggers could clock in at the same speed per boat race in the long run. That being said, most teams would scramble to get Chugger A, while Chugger B would likely struggle to get on a boat racing team, which is where the element of moneyball comes in. How to build a boat racing team that will consistently perform with or without access to the best chuggers. This can be achieved by seeking undervalued chuggers and more specifically chuggers with statistics that are undervalued. In particular, at least in my experience, ability to avoid spills and in particular majors is an extremely undervalued trait, as well as the ability to avoid slowing down significantly on the second beer, which is often overlooked except when choosing an anchor. Moderately fast guy chuggers (2.0-2.5 seconds one beer time) who rarely spill are extremely easy to find on the chugging market compared to a star chugger (1.5-2.0 seconds) who spills somewhat regularly. As an aside, a tie-breaker when choosing between Chugger A and B could be whether or not a team is expected to win or lose (comparing the two beer sum done above for all 10 drinkers on each team or more realistically time trial results). Chugger A would then be chosen when the his team was the underdog due to their ability to produce the best case performances and B would be chosen when the team was favoured for their ability to avoid costly errors which could close the gap between their team and the competition. In the process of choosing individuals, special attention should be paid to choosing girls for a few reasons. First of all, although there are only 4 girls on a team, due to girls being on average slower than guys, girl typically make up 55-65% of the teams total time. Secondly, the supply of females on the chugging market is significantly lower than that of males, with the drop off between the girls on the bubble (3rd and 4th fastest vs 5th or 6th fastest) often being much more pronounced than between guys on the bubble (5th and 6th vs 7th and 8th). Finally, girls typically have a larger drop-off between their first and second beer which can lead to the contribution of 4 girls being more important than people think. In addition, as a general principle, people are more likely to spill when they slow down and may begin to panic, linking the two important traits of drop-off time and spill rates mentioned earlier. I will note that although girls have higher drop-off rates in general, they don’t seem to spill a greater amount. This apparent inconsistency in expected spilling rates may be covered by the issue of egos that can be associated with racing. Typically, guys seem to feel more pressure to perform quickly and seem to over extend in attempts to impress others with greater frequency than girls. Choose a tapper that is experienced and cautious to avoid penalties. A false start is 10 seconds which would erase any small gains made by carefully timed taps over the course of several races. Ensure you have suitable replacements, as over the course of several races people can start to struggle or get drunk and drop off the map to hook up with that impressed spectator in the crowd from the previous race. If you build a team well in advance, don’t overlook the value of practice. Even simulations done with water allow individuals to improve greatly in most cases. At the very least, even if a chugger’s best time doesn’t decrease a lot, their familiarity with their technique will lead to fewer spills, which can be just as valuable if not more. This is a cruel race in which every participant must drink two cups in a row; i.e., everyone is an anchor. While one team must win, in truth everybody loses. Have trashbags at the ready. We go again. That's it. If someone pukes, we go again. Boat races extends to the speedy consumption of any good. Simply replace the first letter with the item of which you will be consuming (e.g. water= Woat Race, Ice Cream= Icoat Race, and so on), the same rules apply. All you can eat sushi is a great venue for this variation. This page was last edited on 9 May 2018, at 16:37.